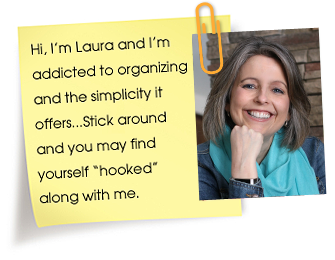 Does all the clutter around you and the idea of decluttering it all overwhelm you? I totally get it. I get overwhelmed with too much stuff as well. It’s absolutely why I purge on a regular and daily basis. But there is something else I do to keep my home decluttered that I haven’t given as much attention to. And that is that I purge in phases. Whenever I organize a space, I never have the mindset that it’s once and done. Oh my that pressure would just be too much. Luckily you don’t have to fall prey to this trap either. Like I said, the easiest way to do this is to purge in phases. Meaning you don’t have to go into an organizing project thinking you need to get RID.OF.ALL.THE.THINGS all at one time. To demonstrate my point I always find it easiest to use an example from my own life which you’ll see below. 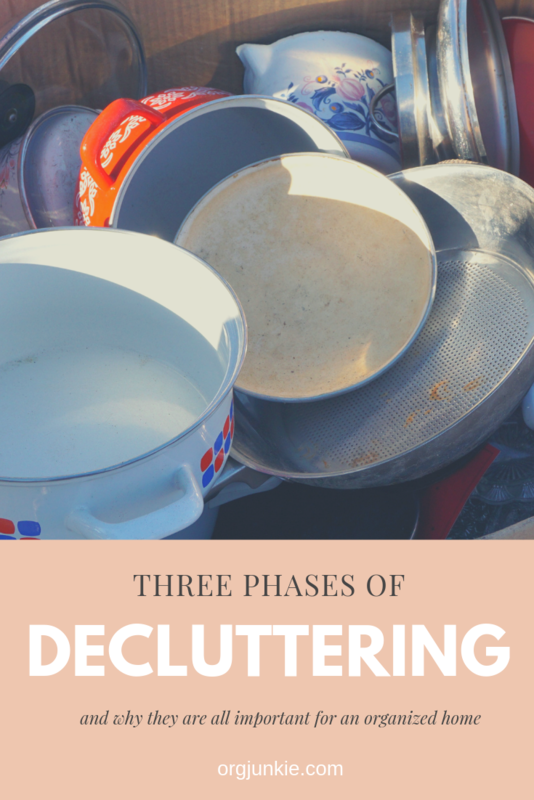 Of course please keep in mind that these phases can be applied to any area of your life whether you are decluttering books, kitchen utensils or even home decor. 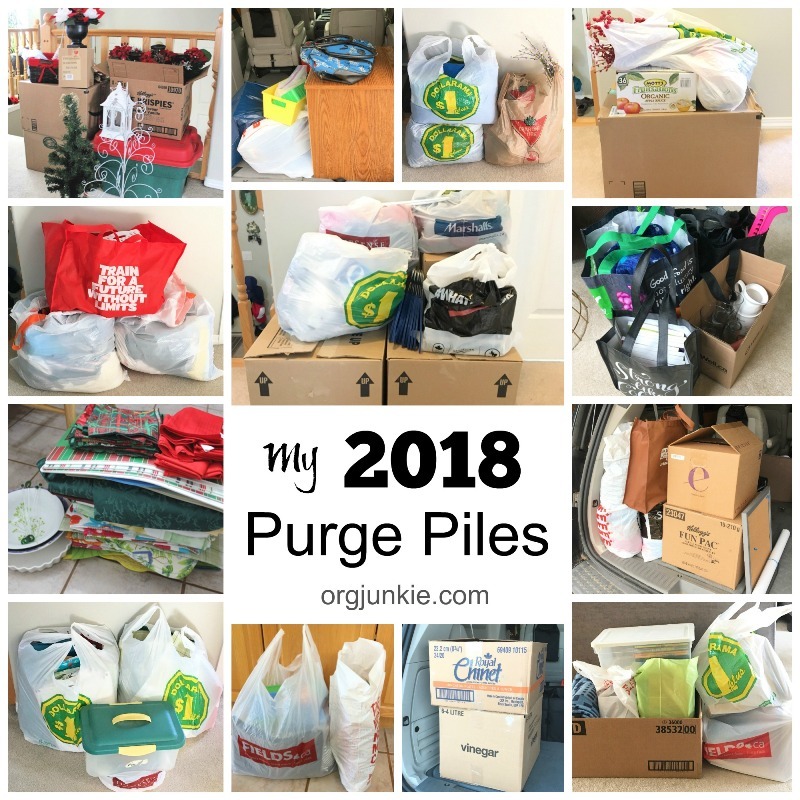 The first phase is all about purging as part of the organizing PROCESS. 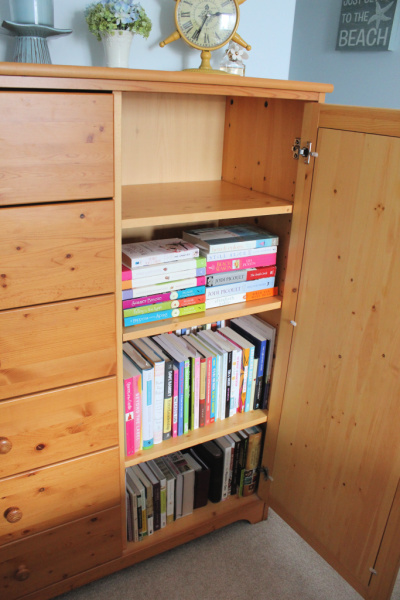 It’s about purging to tidy up a space or purging “until it fits” to create space for something else. This is a first pass of your things that is typically quicker and less stressful. It’s parting with the things you don’t use or love to make room for the things you do. More about that on my Marie Kondo post. 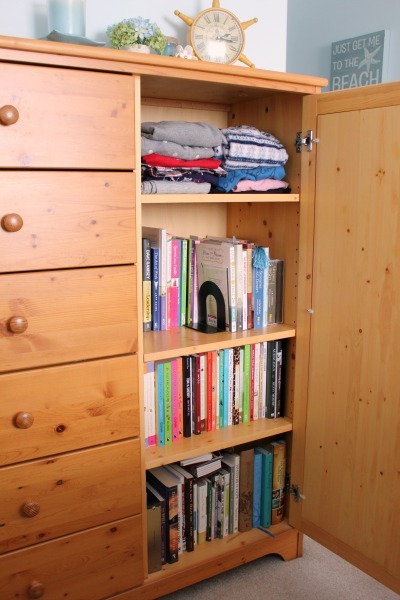 A year ago I shared here on the blog how I purged my bookshelf to make room for some of my winter pajamas. I intentionally purged my books until the one shelf I needed was empty. This picture below is how it turned out. It felt good to get it done and free up some space I needed for something else. 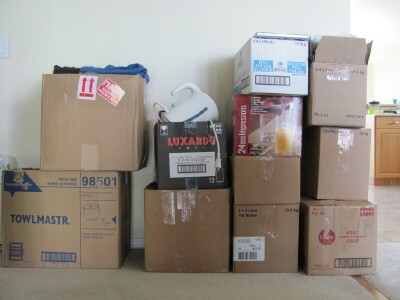 The second phase involves purging for the sole purpose of minimizing the number of things you own. Not necessarily to fill the space back up again or use it for something else but to simply allow for some breathing room. Some white space for your mind and soul to rest. A year after organizing the bookshelf I just mentioned, I opened it up to get a book out and realized that I had still not read many of the books inside. I decided that it was time to purge to minimize them. I didn’t need the space for anything else at the moment but I just didn’t like the idea of using this space for books I wasn’t even reading. It was time to take a second pass at decluttering my books by being a little bit more intentional about the ones I wanted to keep. This phase might sound like a tough one but keep in mind that I’d already done the first phase a year earlier. 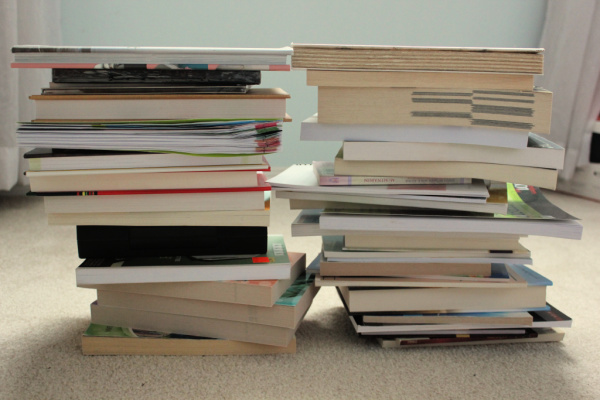 Books that were hard for me to let go of then, I now had a little more perspective on. Books I was sure I wanted to read a year ago, and then didn’t, made parting with them so much easier this time around. In addition, just because I have the space doesn’t mean I necessarily need to fill it. 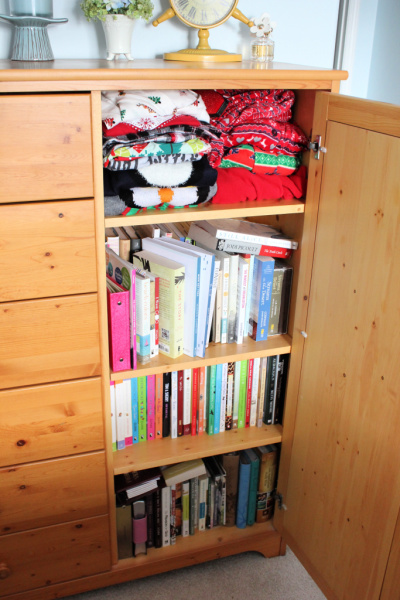 In fact the top shelf now sits empty because I no longer need it for pajamas (or Christmas clothes). That’s not to say I won’t eventually have a need for that space but for now I’m enjoying the possibility of what it could be. And eventually I’ll have another shelf empty to use as well. Those books you see on the second shelf are my only fiction books left. I’ve given myself the rest of the year to read them. If it doesn’t happen I’m letting them go. My shelf as it is currently. And all the books I let go of this time around. The freedom that comes with owning less can be so rewarding. Finally the third phase takes purging to a whole other level typically with the idea of moving in mind. Often to a smaller home with less space and storage. We had to do that when we moved from BC to Alberta. Our home here is so much smaller. It wasn’t by choice though, it was simply what we could afford in a different market. Now after living here for almost 8 years I can honestly say that I love this smaller home so much better than our big three story BC home. We had to do so much downsizing to fit into this home and yet I miss none of the stuff we had to let go of. Some of you who have been here a long time will remember all the purge pictures I posted from that time. Here’s one of them. It was definitely a major downsize even if at the beginning it kind of freaked me out a bit. This home feels cozier and I like that I always know where everyone is as opposed to the last house where I was constantly yelling “where are you?” The best part though is how much easier a smaller home with less stuff is to clean. Yay! These three different phases of organizing are all equally important but don’t necessarily have to do done in order. However when you are feeling overwhelmed you might want to park on phase one. Hang out there for awhile and get a feel for it. Remember only you can decide what ultimately works for you and your family. Sometimes phase two will naturally follow phase one. And sometimes, depending on how keen you are, the two can happen simultaneously. Each phase plays a huge role in simplifying and creating a life for you and your family that ideally contains less clutter and chaos. And that my friends is the real beauty of purging! What will you be letting go of this week?